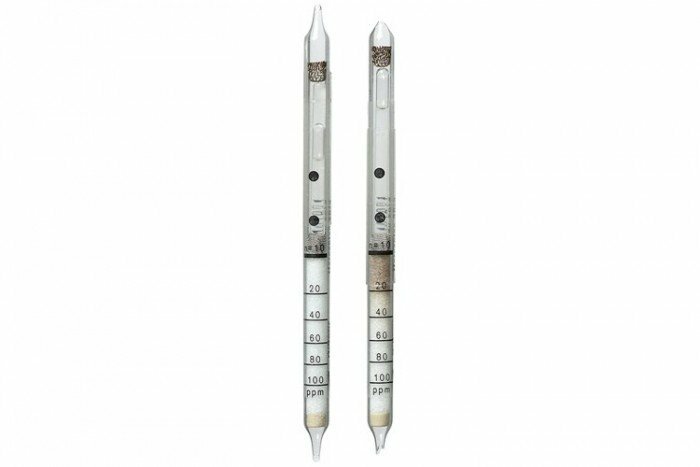 These short-term detection tubes are for Mercaptan (20/a) and have a measurement range of 20 to 1000 ppm. It can detect additional substances such as methyl mercaptan and phenylmercaptan. It has a shelf life of 2 years and comes in a pack of 10 tubes. Higher molecular weight alkyl mercaptans (e.g. propyl- and butylmercaptans) are indicated with approximately the same sensitivity. Hydrogen sulfide is indicated with approximately twice the sensitivity of the mercaptans (e.g. 10 ppm hydrogen sulfide gives an indication of 20 ppm). 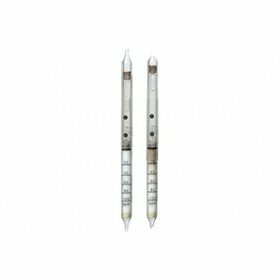 In presence of Hydrogen Sulfide a measurement of mercaptans is impossible. After performing the required ten pump strokes the reagent ampoule must be broken. The liquid of the ampoule must be transferred to the indicating layer and carefully drawn through it using the pump. After completing the measurement wait for 3 min prior to evaluation.